While clouds appear in infinite shapes and sizes they fall into some basic forms. From his Essay of the Modifications of Clouds (1803) Luke Howard divided clouds into three categories; cirrus, cumulus and stratus. The Latin word 'cirro' means curl of hair. Composed of ice crystals, cirro-form clouds are whitish and hair-like. There are the high, wispy clouds to first appear in advance of a low pressure area such as a mid-latitude storm system or a tropical system such as a hurricane. Generally detached clouds, they look like white fluffy cotton balls. They show vertical motion or thermal uplift of air taking place in the atmosphere. They are usually dense in appearance with sharp outlines. The base of cumulus clouds are generally flat and occurs at the altitude where the moisture in rising air condenses. From the Latin word for 'layer' these clouds are usually broad and fairly wide spread appearing like a blanket. They result from non-convective rising air and tend to occur along and to the north of warm fronts. The edges of strato-form clouds are diffuse. Howard also designated a special rainy cloud category which combined the three forms Cumulo + Cirro + Stratus. He called this cloud, 'Nimbus', the Latin word for rain. The vast majority of precipitation occurs from nimbo-form clouds and therefore these clouds have the greatest vertical height. The traditional division between the Polar and Temperate Regions is the Arctic Circle (66.5°N) in the Northern Hemisphere and the Antarctic Circle (66.5°S) in the Southern Hemisphere. The division between the Temperate and Tropical Regions are the Tropics of Cancer (23.5°N) in the Northern Hemisphere and the Tropics of Capricorn (23.5°S) in the Southern Hemisphere. The actual division between these regions varies from day to day and season to season. 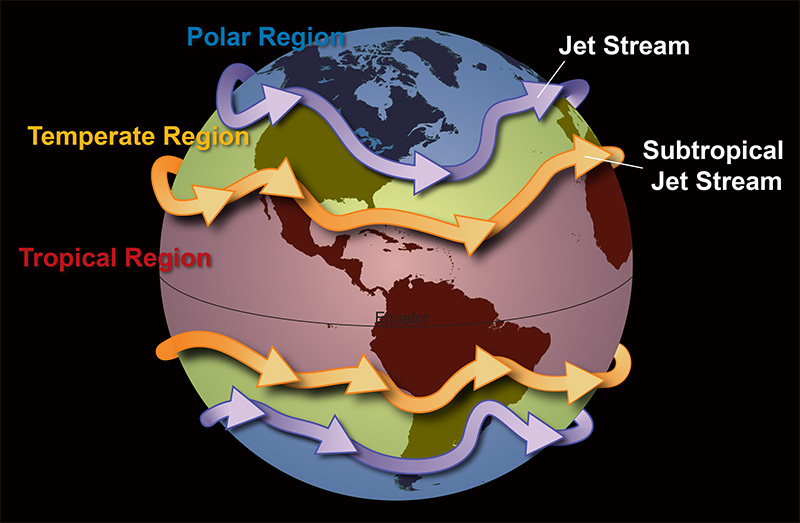 Between the Polar and Temperate Regions lies the jet stream in both hemispheres, while the Sub-Tropical Jet Stream divides the Temperate and Tropical Regions. One effect of these cores of strong wind is the maximum altitude of the tropopause decreases in each region as one moves from the equator to the poles. 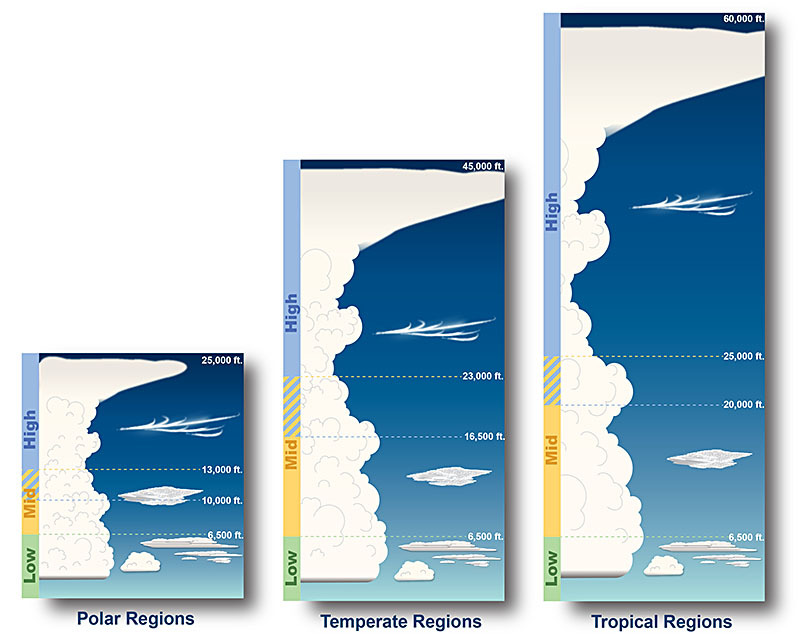 Generally, as the tropopause's height decreases, the elevations at which clouds occur also decreases. The exception is for low clouds which are officially said to have cloud bases within the first 6,500 feet (2,000 meters) of the surface in each region. But even that is not always the case. The base of cumulus and cumulonimbus clouds can sometimes be higher than 6,500 feet (2,000 meters). During summertime, the base of these convective clouds will be well in to the mid-level cloud range in the non-mountainous areas of the southwest United States. Cumulus cloud bases have been observed up to 9,000 feet (2,750 meters) over North Central Texas and thunderstorms, with cloud bases from 11,000 to 12,000 feet (3,350 to 3,650 meters), have occurred near San Angelo, Texas. This happens when, despite the dry lower level of the atmosphere, the atmosphere in the mid-levels is fairly moist and unstable. The dryness of the lower level is such that parcels of air need to rise up to two miles (3 km), and sometimes more, before the they cool to the point of condensation. Since the jet stream follows the sun, it shifts toward the equator as winter progresses. Therefore, the polar region expands and the temperate region moves toward the equator. In summer, the Tropical Region expands shifting the temperate region toward the poles while the polar region shrinks. The division between these regions varies from day to day and season to season based upon locations of the jet and sub-tropical jetstreams.